Just like businesses, many associations compete in a marketplace of demand and supply. There is a demand for benefits and services from current and potential members. Often, there is a supply of benefits and services from more than one provider (i.e., more than one association). In some industries, we have seen more than six different professional associations competing in the same marketplace. This could be a sign of a saturated market. In a saturated market, its important to understand how your association stacks up to your competition. 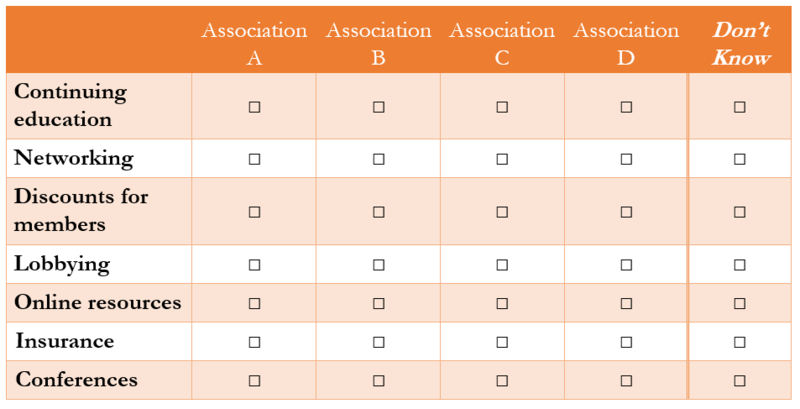 This knowledge will help you identify your association’s strengths and weaknesses relative to other associations, and it can help you identify your sweet-spot services and your target market. For each service/benefit below, mark the association that is best at providing it. When this type of survey question is paired with a question about the importance of each benefit, the results can help you hone in on what important benefits your association provides better or worse than your competition. A benefit that is deemed important by many people in your market, but that no association is clearly known for being best at providing, suggests an opportunity for your association to fill an unmet or under-met demand.